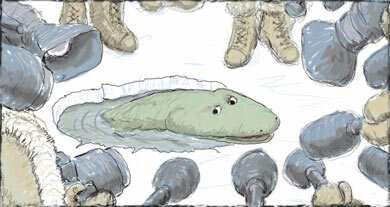 Tiktaalik, from the Nunavut Territory, Canada, has dazzled the scientific community and the world media. Gaps in the fossil record are diminishing. The dramatic discovery of Tiktaalik roseae has provided an impressive and informative transitional form between lobe-fin fishes and early tetrapods. Dubbed a "fishapod", Tiktaalik is one of several recent discoveries that have greatly enhanced our understanding of the evolution of the first tetrapods. The Devonian Period (417-354 MYA) was a time of profound changes in terrestrial and aquatic ecosystems. These changes set the stage for the evolution of tetrapods and their expansion onto the land.